Jeff attended the University of Virginia where he appeared in 88 matches, scored 17 goals, and was the only four-time All-American in Cavalier history. He was named Soccer America’s co-freshman of the year in 1986, and the ACC’s Most Valuable Player in 1998. He led the Cavaliers to the NCAA Championship in 1989 and finished second in voting for the Hermann Trophy that year. 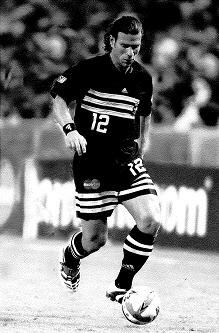 Jeff was a member of US National Teams, including the U15, U17, U20, Olympic, World University, and Futsal Teams, as well as the 1998 and 2002 World Cup squads. In 1995 he returned to the University of Virginia to serve as assistant coach with Bruce Arena. Jeff has been a part of five MLS Cup championship teams, including DC United in 1996, 1997, and 1999. After retiring as a player after the 2005 season, Jeff became the Sporting Director for the New York Red Bulls and also served on the board of DC Scores. In 2011 Jeff moved to MLS and is currently the Vice President of Competition.